Emerging Membrane Technology for Sustainable Water Treatment provides the latest information on the impending crisis posed by water stress and poor sanitation, a timely issue that is one of the greatest human challenges of the 21st century. 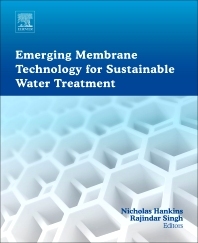 The book also discusses the use of membrane technology, a serious contender that can be used to confront the crisis on a global scale, along with its specific uses as a solution to this escalating problem. Chemical and environmental engineers working in membrane treatment of water and waste-water; graduate and postgraduate students and researchers in academia; government and corporate labs; and water treatment equipment and global engineering companies. Rajindar Singh is President of Membrane Ventures, LLC. He is a Senior Member of the American Institute of Chemical Engineers, with more than 35 years of experience focusing on desalination, bioseparations, ion exchange, high purity water production, produced water treatment, membrane plants technical support, electrochemical fuel cells and polymers. Rajindar received post-graduate degrees in chemical engineering and bioengineering from the University of Massachusetts, Amherst, USA. He is the co-inventor of six patents, and has published 40 journal papers and three books. Professor Nicholas Hankins is an Associate Professor of Chemical Engineering at The University of Oxford, and a Tutorial Fellow in Engineering at Lady Margaret Hall. He is Research Director of the Oxford Centre for Sustainable Water Engineering at Oxford University, and is the Oxford Director of the Singapore-Peking-Oxford Research enterprise. He is a Chartered Chemical Engineer, with over 26 years of research experience in industry and academia. His research has focused on the application of membranes, colloids, surfactants and interfaces to sustainable processes for potable water and wastewater treatment. He has published over 40 refereed journal articles and three chapters in books. He is Co Editor in Chief of the Elsevier Journal of Water Process Engineering and sits on the editorial board of Desalination, Desalination and Water Treatment, and Water. He is the founding chairman and organizer of the Oxford Water and Membranes Research Event, which he has run biennially since 2006.